"Interstate 90 in Indiana" redirects here. For the entire length of the highway, see Interstate 90. The Indiana Toll Road, officially the Indiana East–West Toll Road, is a tolled freeway that runs for 156.28 miles (251.51 km) east–west across northern Indiana from the Illinois state line to the Ohio state line. It has been advertised as the "Main Street of the Midwest". The entire toll road is designated as part of Interstate 90, and the segment from Lake Station east to the Ohio state line is a concurrency with Interstate 80. The toll road is owned by the Indiana Finance Authority and operated by the Indiana Toll Road Concession Company, which is owned by IFM Investors. The Indiana Toll Road is part of the U.S. Interstate Highway System which runs 156.28 miles (251.51 km) through Indiana connecting the Chicago Skyway to the Ohio Turnpike. The toll road is 156.28 miles (251.51 km) long, and is signed with Interstate 90 for its entire length, as well as Interstate 80 east of Lake Station, after having run concurrently with I-94. Exit points are based on the milepost system, with exits starting at 0 at the Illinois state line, and increasing to exit 153 at the Eastpoint toll barrier near the Ohio state line (technically, not an exit, as the only road accessible from there is the Ohio Turnpike, but toll tickets issued at the barrier are marked "Entry 153"). The Toll Road opened in 1956 with sequential exit numbering, which was converted to the current mileage-based scheme in 1981. The original number sequence was amended slightly in 1964 with the opening of the then-Burns Harbor, now Lake Station exit. The farthest it gets from the Michigan state line or Lake Michigan is about 10 miles (16 km). Looking north at exit 121 (State Road 9) allows one to see the "Welcome to Michigan" sign in the distance. At one point in northern Indiana, in Greenfield Township in LaGrange County at mile 132, the toll road comes within about 200 yards (180 m), or 0.1 miles (0.16 km), from the Michigan border. Control cities on guide signs are Chicago and Ohio. Originally they were "Chicago and West" and "Ohio and East". The Indiana Toll Road was publicly financed and constructed during the 1950s. It opened in stages, east to west, between August and November 1956. The formal dedication ceremony was held on September 17, 1956. The final course of the Toll Road was the northern of four planned alignments. In addition to the east–west toll road, a north–south toll road was planned, roughly along the path of today's I-65, but the plan was dropped after the Federal-Aid Highway Act of 1956 was passed. Originally the I-94 designation was applied to the highway west of where the current interchange with I-94 was eventually built, with I-90 following I-80 to the west along the Borman Expressway as I-94 does now, the completed portions of the Borman being designated as I-80, I-90, and I-294. The current routing became effective around 1965, to avoid the confusion that had resulted from I-80, I-90, and I-94 all changing roadways there. As a result, a stretch of I-94 is actually farther south than I-90, and I-90 runs the entire length of the Indiana Toll Road. I-294 was also cut back to the Tri-State Tollway at that time, and thus no longer enters Indiana. Several interchanges on the Toll Road were constructed between 1980 and 1985 as part of a bond sale in October 1980. The Indiana Toll Road Commission operated the toll road from its inception until 1981. The Indiana Department of Transportation operated the toll road between 1981 and 2006. On April 1, 1983, the State of Indiana established the Indiana Toll Finance Authority, which was renamed the Indiana Transportation Finance Authority in April 1988. It was consolidated with several other state financial agencies and renamed the Indiana Finance Authority in May 2005. From its inception in 1983, the Indiana Finance Authority has maintained ownership of the Toll Road (and other state-owned highways in Indiana), while its operations and maintenance have evolved over time, starting with the Indiana Department of Transportation until transitioning to the Indiana Toll Road Concession Company in 2006. Upon taking office in 2005, Governor Mitch Daniels began looking for ways to fund a backlog of Indiana highway maintenance and construction. Working with Goldman Sachs & Co., who was reported to have earned some $20 million in fees, the state requested bids to lease the Toll Road in exchange for the right to maintain, operate, and collect tolls for the following 75 years. A consortium made up of the construction firm Cintra of Spain and Macquarie Atlas Roads (MQA) of Australia, the same firms that had taken over the Chicago Skyway in 2004, submitted the winning bid of $3.8 billion. Their bid was $1 billion more than the next highest bid.. The deal was completed on June 29, 2006, and the two companies formed the Indiana Toll Road Concession Company to operate the road. Opponents of the proposal filed a lawsuit in St. Joseph County in late April 2006. Following roughly two weeks of arguments, Judge Michael Scopelitis ruled in favor of the State of Indiana, declaring the lawsuit brought by opponents a public lawsuit and therefore requiring the plaintiffs to post a bond of $1.9 billion for the case to proceed. The plaintiffs appealed Scopelitis' ruling to the Indiana Supreme Court, which on June 20, 2006, in a 4–0 decision, upheld Scopelitis' earlier decision, allowing the lease of the Indiana Toll Road to proceed as scheduled. The proceeds funded a portion of the extension of I-69 through southwestern Indiana as well as a number of other highway projects throughout the state. The legislation also authorized the governor to establish a similar public-private partnership agreement for design, construction, and operation of the proposed Southern Indiana Toll Road (SITR), which would make up 117 miles (188 km) of the planned 142-mile (229 km) extension of I-69 from Indianapolis to Evansville. On November 9, 2006, Daniels announced the I-69 extension would not be tolled. In lieu of the SITR, I-69 was built using $700 million of the Major Moves payout for the section from the I-64/I-164 interchange to Crane Naval Surface Warfare Center. Some elected officials and candidates for office in the toll road counties expressed concerns that projects in and around Indianapolis would receive too large a share of the lease proceeds to the detriment of northern Indiana. Pat Bauer, a Democratic state representative from South Bend and minority leader in the Indiana House of Representatives, issued a written statement the day before funding was distributed to the counties mocking Major Moves. "Now that the deal is done, the governor and officials in his administration have traveled the state to claim that the sale has financed every major road project scheduled over the next decade," Bauer said. "The fact is that most of these projects already were on course to be completed, without any assistance from the sale of the toll road." On September 15, 2006, funds were distributed to the seven counties through which the toll road runs. The list below details each county's total share in the Major Moves money. Some of the funds from each county's distribution were directed to the cities and towns within that county. ^ Total distribution amount would have been $40 million if Laporte County had joined the Northwest Indiana Regional Development Authority by September 15, 2006. Since it did not, the total distribution amount was $25 million. In December 2006, ITR Concession Company announced that a South Bend student, Andrea Hebster, would "receive $5,000 toward her educational expenses for being selected as the grand prizewinner of the Indiana Toll Road logo design contest". The new ITRCC logo roll out occurred in early 2007. The Cintra-Macquarie consortium filed for bankruptcy in September 2014, citing lower than projected traffic volumes and revenues. Democratic U.S. Senator Joe Donnelly urged Republican Governor Mike Pence to return the road to public control. However, Pence instead ordered a tender process to replace the operator, and ultimately approved the purchase of the road by IFM Partners, an Australia-based firm. Between the Westpoint barrier toll, near the Illinois state line, and the Portage barrier at milepost 24, tolls are collected in fixed-amounts at exit and entrance ramps. Between the Portage barrier, east to the Eastpoint barrier toll, near the Ohio state line, it is operated as a closed ticket system toll road, where one receives a ticket upon entering and pays a pre-calculated amount based on distance traveled when exiting. As of July 2018, standard passenger cars are charged a toll of $8.73 for E-ZPass users and $8.70 for cash users along the section from Portage to Eastpoint, with an extra $2.39 for E-ZPass users and $2.40 for cash users at the Westpoint barrier. Originally the entire toll road was on a closed ticket system, with Westpoint at current exit 5, roughly under the East 141st Street overpass. This changed after the Indiana Department of Transportation (INDOT) takeover in 1981. Effective June 25, 2007, the Indiana Toll Road began electronic toll collection with the i-Zoom system. i-Zoom was fully compatible with the E-ZPass and I-Pass electronic toll collection systems. Indiana became the 12th state to use the E-ZPass system. The i-Zoom brand name was retired starting in September 2012 to take advantage of the already-existing E-ZPass brand and to avert confusion with the upcoming Ohio River Bridges Project in the Louisville metro, which is managed by the Louisville-Southern Indiana Bridge Authority and uses the E-ZPass system. Like all other toll highways built in the 1950s, the Indiana Toll Road has had service areas (called travel plazas) since its opening. Originally, there were eight pairs of travel plazas located approximately every 18 miles (29 km). Of these, five featured sit-down restaurants operated by Hosts International while the other three had only snack bars. Each travel plaza was named after a prominent Indiana native or resident. Gasoline and other auto services were available at all travel plazas. Originally, various oil companies including Standard Oil, Sinclair, Pure, Gulf, Texaco and Citgo operated each of the travel plazas. Later, Standard Oil, later Amoco and now BP, assumed operations at all travel plazas. Currently BP operates the three western travel plazas while Mobil operates the two easternmost pairs. The westernmost snack bar at milepost 37.5 remained open until the mid-70s and is now used as a "Truck Only Parking" rest area with no facilities. The other two at mileposts 72.9 and 108 were closed in 1972, although the one at 108 was also converted into a truck parking area without facilities. All were demolished except for one, the former Benjamin Harrison snack bar on the eastbound side at milepost 72.9. It presently serves as a state police station and has no public facilities. The restaurant interiors were remodeled into short-order cafeterias in the late 1970s when Gladieux Food Services took over operations and have since been remodeled once again for fast food service. However, the original buildings remain relatively unchanged from the outside. In June 2015, Ken Daley, the new CEO of the Indiana Toll Road Concession Company, announced that all of the original 1955 travel plazas would be demolished and replaced within the next five years. As of October 2015, the Booth Tarkington service area, the easternmost in Indiana, was permanently closed. Part of the agreement to privatize operations of the Indiana Toll Road is to invest $600 million in the ITR during the first nine years of the lease. This is above and beyond the $3.8 billion being invested by the State of Indiana in Major Moves projects. More than $300 million has already been invested in improving the Indiana Toll Road. Some examples include: third-lane expansion project at $250 million; electronic toll collection (i-Zoom) at $40 million; and Toll Plaza expansions (MP 1, 23, 156) at $9 million total. Included in the plans is adding a third lane in each direction in the most congested area of the Indiana Toll Road: from MP 10–15.5. The third-lane expansion was completed in December 2011. The 10-year Bridge Capital Improvement plan is also under way, which will repair and rehabilitate nearly every structure on the ITR over the next 10 years. The lease agreement also requires ITRCC to maintain or improve the condition of the Toll Road to standards set forth by state and federal law. ^ Adderly, Kevin (February 5, 2019). "Table 1: Main Routes of the Dwight D. Eisenhower National System of Interstate and Defense Highways as of December 31, 2018". Route Log and Finder List. Federal Highway Administration. Retrieved March 23, 2019. ^ Indiana General Assembly (May 4, 2006). "Title 105, Article 14: Toll Roads" (PDF). Indiana Administrative Code. Office of Code Revision Indiana Legislative Services Agency. Retrieved March 7, 2010. ^ United States Geological Survey (1960). Bronson South, MI–IN (Topographic map). 1:24,000. 7.5 Minute Series. Reston, VA: United States Geological Survey. Retrieved June 18, 2017. ^ "Throwback Thursday: The 1956 Opening of the Indiana Toll Road, the Highway to the Future". South Bend Tribune. June 28, 2018. Photograph 36 of 44. Retrieved June 28, 2018. On Sept. 5, 1956, an employee removes a covering on a directional sign on the soon-to-open Indiana Toll Road. ^ a b c Wensits, James (January 22, 2006). "Indiana's Toll Road Seen as Link in a Chain". South Bend Tribune. Retrieved June 18, 2017. ^ a b c d e f Indiana Department of Transportation (1991). 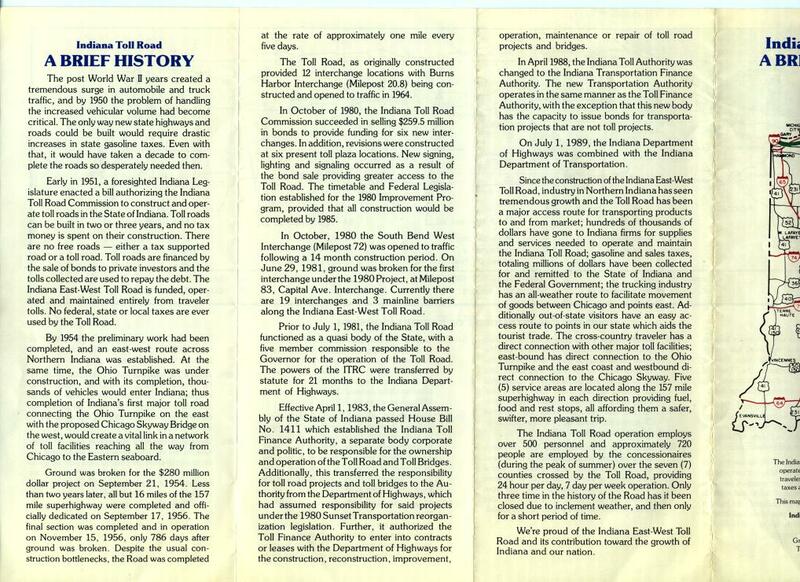 Indiana Toll Road: A Brief History (Brochure). Indiana Department of Transportation. Retrieved June 18, 2017. ^ Ripple, David Alan; Joint Highway Research Project; Indiana State Highway Commission (1975). History of the Interstate Highway in Indiana: Final Report. West Lafayette, IN: Joint Highway Research Project. Figure 108: Alternative Indiana Toll Road Routes. OCLC 70935546. Archived from the original on April 14, 2004. Retrieved April 25, 2008. ^ Indiana General Assembly. "Title 8, Article 9.5, Chapter 8". Indiana Administrative Code. Office of Code Revision Indiana Legislative Services Agency. Retrieved September 20, 2011. ^ a b Puentes, Robert (October 3, 2014). "The Indiana Toll Road: How Did a Good Deal Go Bad?". Forbes. Retrieved November 20, 2017. ^ Knight, Jerry (March 20, 2006). "Infrastructure: A Road to Riches?". The Washington Post. Retrieved May 16, 2011. ^ Schulman, Daniel (January 1, 2007). "The Highwaymen". Mother Jones. Retrieved April 30, 2007. ^ Ruthhart, Bill (February 6, 2006). "Toll Road Counties Object". The Indianapolis Star. pp. B1, B5. ISSN 1930-2533. Retrieved March 12, 2019 – via Newspapers.com. ^ a b c d e f g Office of Indiana Auditor of State (September 15, 2006). Major Moves Construction Fund Distribution (PDF). Office of Indiana Auditor of State. Archived from the original (PDF) on September 27, 2006. ^ "Day-by-Day Chronology". LaPorte Herald Argus. December 30, 2006. Retrieved November 20, 2017. ^ Indiana Toll Road Concession Company (December 15, 2006). "Indiana Toll Road Awards Local Student $5,000 for Educational Expenses" (PDF) (Press release). Archived from the original (PDF) on April 23, 2015. Retrieved June 18, 2017. ^ Bathon, Michael (September 22, 2014). "Indiana Toll Road Seeks Bankruptcy as Traffic Declines". Bloomberg. Retrieved October 13, 2014. ^ "Trump's $1 Trillion Infrastructure Plan Is Actually Pence's—and It's All About Privatization". Newsweek. September 4, 2017. Retrieved September 6, 2017. ^ "Travel Information". Indiana Toll Road Concession Company. Retrieved November 21, 2018. ^ "E-ZPass Replaces 'i-Zoom' Brand". South Bend Tribune. September 10, 2012. p. A3. OCLC 8793233. Retrieved March 23, 2019 – via Newspapers.com. ^ a b Northern Indiana Tourism Development Commission; Indiana Department of Transportation: Toll Road District. "Northern Indiana Area Map" (PDF). Northern Indiana Tourism Development Commission; Indiana Department of Transportation Toll Road District. Archived from the original (PDF) on November 30, 2007. Retrieved September 20, 2011. ^ Shnay, Jerry (August 4, 1968). "Firm Supplies 'Hosts' with Tons of Food". Chicago Tribune (Indiana ed.). § 10, p. 9. ISSN 1085-6706. Retrieved March 23, 2019 – via Newspapers.com. ^ "The People Behind the Names". South Bend Tribune. January 22, 2006. p. A9. OCLC 8793233. Retrieved March 23, 2019 – via Newspapers.com. ^ "Indiana Toll Road Pact Awarded to Gladieux". The Blade. Toledo, OH. December 27, 1974. p. 17. OCLC 12962717. ^ "Change Restaurant Concession Rights Along Toll Road". Times-Union. Warsaw, IN. United Press International. December 21, 1974. p. 2. ^ "Indiana Toll Road Rest Stops to Be Demolished, Rebuilt". The Daily Journal. Franklin, IN. June 20–21, 2016. p. A6. Retrieved March 23, 2019 – via Newspapers.com. ^ Indiana Department of Transportation (2004). "Reference Post Book" (PDF). Indianapolis, IN: Indiana Department of Transportation. I-90. Archived from the original (PDF) on June 15, 2011. Retrieved September 5, 2011. ^ Wensits, James (October 27, 1980). "Toll Road Plaza Opened". South Bend Tribune. p. 23. OCLC 8793233 – via Newspapers.com. ^ "Access Roads Open for Airport 2010 Development Work". South Bend Tribune. September 3, 1993. p. B4. OCLC 8793233 – via Newspapers.com. ^ Johnson, Judy L. (November 17, 1982). "Interchange: Tourism Aid". South Bend Tribune. p. 1. OCLC 8793233 – via Newspapers.com. ^ "Throwback Thursday: The 1956 Opening of the Indiana Toll Road, the Highway to the Future". South Bend Tribune. June 28, 2018. Photograph 44 of 44. Retrieved June 28, 2018. In November 1982, Mishawaka Mayor Maggie Prickett is the first motorist to drive onto the Indiana Toll Road at the newly constructed Mishawaka interchange. ^ Ferak, John (October 10, 1997). "Last Link on Area Road Loop Forged: Toll Interchange Opens to East Elkhart". South Bend Tribune. p. C1. OCLC 8793233 – via Newspapers.com. ^ Meyer, Bernie (August 16, 1983). "Orr Attends Opening of Interchange". South Bend Tribune. p. IN-3. OCLC 8793233 – via Newspapers.com. Wikimedia Commons has media related to Interstate 80 in Indiana and Interstate 90 in Indiana. "Indiana Toll Road Photos". Roadfan.com. Includes a 1954 photograph of the Toll Road under construction. Rate, Betsy (September 16, 2011). "City for sale". Need to Know. PBS. ITR, Chicago, Indianapolis, Harrisburg and other public entities' experiences with privatization, in a national context.